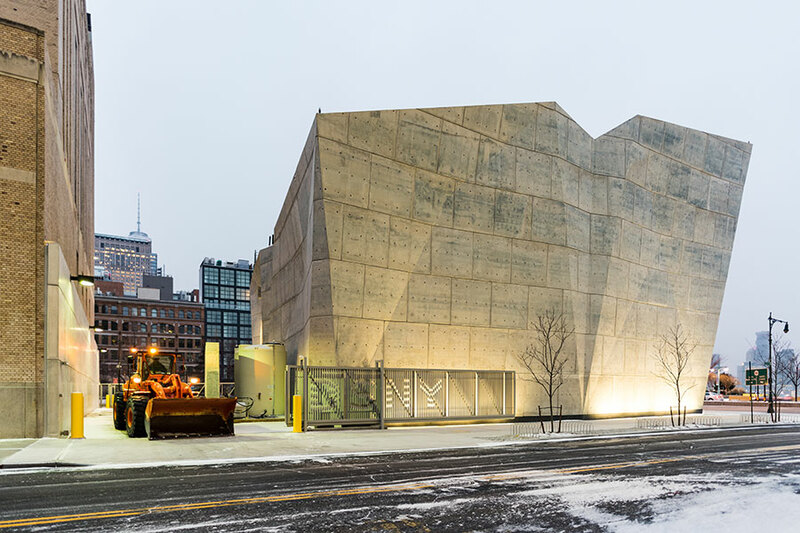 WXY and Dattner Architects’ Spring Street Salt Shed joins a select few buildings in New York City that can be considered estranged urban objects as much as architecture. The city consists of a multitude of architectural and infrastructural objects. We tend to resist the description of “object,” for we typically find that the life of urbanity comes from events, not blunt material things. It is through programmatic activities that we experience the vibrancy of human occupancy that lends quality to the experience of the city. These activities come so much to the fore that architecture often drifts into a backdrop experienced in a habitual state of distraction. 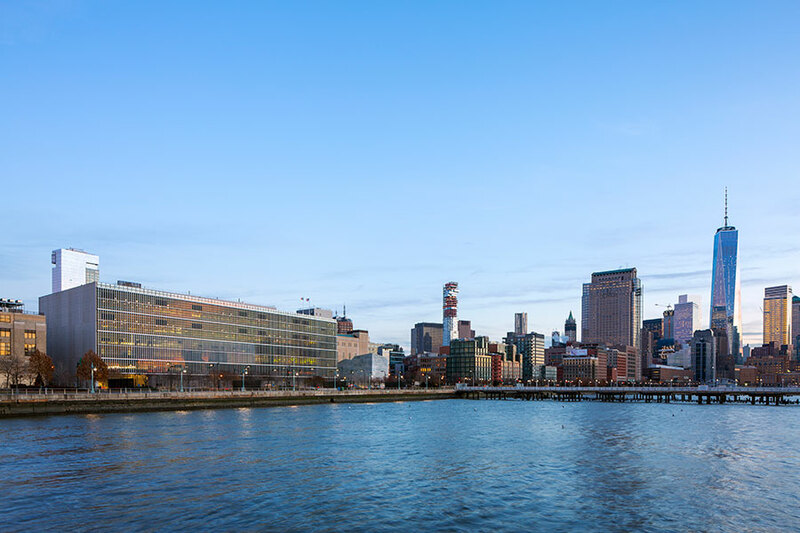 In a city such as New York, architecture is often only noticed by someone unaccustomed to it—the tourist—or when a change in demolition or construction reconfigures it. Even so, these changes usually amount to new amenities, new restaurants, new residences, new offices; changes that fit comfortably within the set of activities of the city, and after a brief period of acclimation settle into the background again. But not all urban structures are so easily assimilated. There are a collection of buildings in the city that always strike one as other, as something not easily reduced to the events of inhabitation. I define these as objects, for these structures maintain their objecthood over a longer period of time than other buildings. 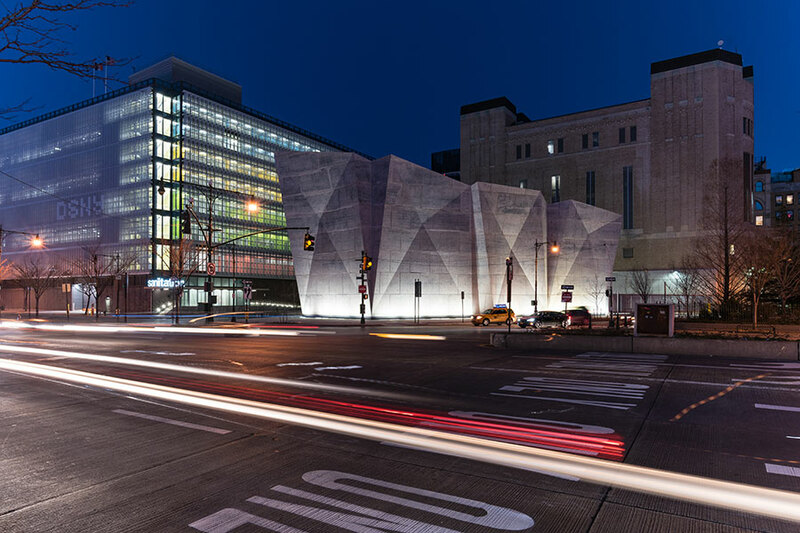 Two examples in downtown Manhattan that testify to this quality are the Brooklyn–Battery Tunnel Ventilation building and the lower west side’s new Salt Shed. Even though I know the nominal usage for these structures (for air exhaust and salt storage respectively), I don’t know how I can use them. I cannot enter these structures, physically, visually, or even conceptually, for in a way they are buildings that are not for people, their function is on a different scale of material organization. As such, these buildings remain objects that resist reduction to the relations of human events. This “objectness” can often be viewed negatively as these constructions do not in themselves provide any activities for urban street life. I would like to argue otherwise. The positive appreciation of a city should not be reducible to the amount of people on a street, to the amount of restaurants, to the amount of shopping, to the price per square foot of commercial exchange. This reduction of the city to commerce is one of the underlying drivers of how urban success is measured. Manhattan real estate crossed one trillion dollars in worth recently, and this number seems to attest to the strength and vibrancy of the city. Stone, glass, and concrete disappear into an abstraction of economic data. The reader may now quickly suggest that the Brooklyn–Battery Tunnel Ventilation building and the Salt Shed are nothing if not gigantic components in the economic engine allowing car traffic to access the densest part of the city and continue to function during inclement weather. This is, of course, correct regarding the functional necessity of these buildings. But, this is not the crux of the argument. When I walk past Battery Park, the ventilation building always strikes me. Why? It is not a beautiful building; it is not even that interesting as an architectural design, so why does it hit me? One reason: It is a freestanding building with no windows. This makes me think, ‘what the hell is going on in there?’ The absence of aperture suggests that this thing may not be for human inhabitation. It is the following condition where things get interesting. The elongated intensification of attention that the exhaust building created forces me to look at all of the buildings nearby differently. They leap out of their background for a moment, and become exactly what they are, aesthetic objects in the city. And during this experience I see the city for the material fact that it is. This is what a successful urban object can do. It disturbs, or estranges, the background of reality for a moment and allows an engagement with the city in an alternate matter. Without moments like this, the city quickly becomes a habitually consumed image, smoothly operating as a backdrop for tourism, domesticity, labor, consumption, and investment. This is why I quite like the new Salt Shed. The first time I saw it I had the reaction of “What the hell is this?” Yes, it does have a striking form of faceted geometry and a raw exposed concrete surface that speaks a language of difference in relation to its context. But, as important as these formal and material aspects are for the architecture, they are doubled when I realized that I could see no doors or windows, no exterior indication of interior use, the appearance of a single solid mass. I have no idea if this structure serves its function successfully. (I hope it does, for I would like it to stay). I also have no idea about the symbolic associations desired by the architects. My interest in the building is not to be found in these explanations of functional or cultural meaning. Instead its strength is similar to the best aesthetic abstractions; it resists interpretation and obscures easy understandings. When you see it, you don’t know what to do with it. It forces you to look at it longer, more intensely, differently. This aesthetic shift offers a re-engagement with the city in its vicinity, it pushes the background to the fore for a moment and allows one to consider just how abstract and artificial the construct of “the city” as material reality actually is. It is in these moments that the aesthetics of the city come alive, which is quite a wonderful gift to the City of New York.